In this timeless looking black and white photograph, a newly married Gulfport Mississippi couple enjoys their first dance as husband and wife during their reception at the Slavonian Lodge in Biloxi. 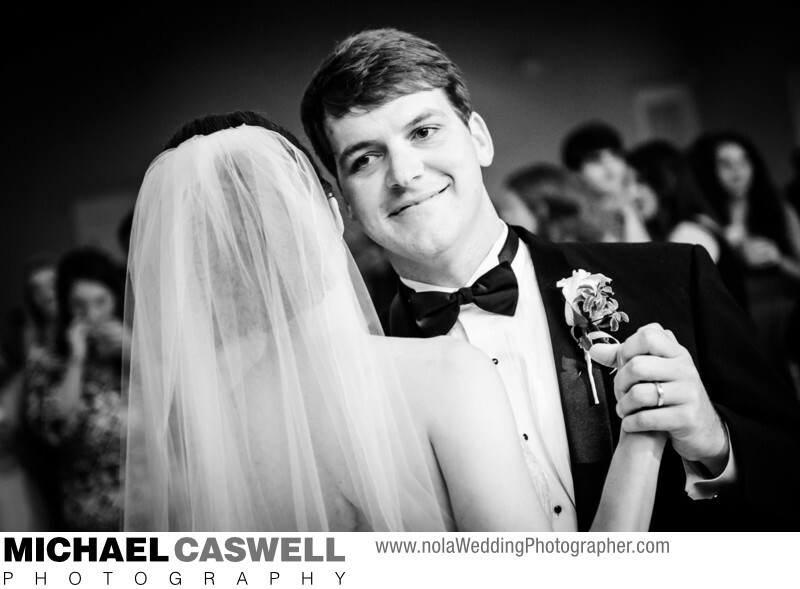 The Slavonian Lodge is truly a wonderful Gulf Coast wedding venue in Mississippi. It features very elegant decor, is quite spacious, and is run by genuinely nice people. A large stage can accommodate just about any band you could imagine. It's also not too far from several popular churches, such as St. Michael's (the Fisherman's Church), and the Cathedral of the Nativity Blessed Virgin Mary, which is where their ceremony took place. The couple's first dance is a great time to capture beautiful documentary-style images of them, as the dance floor will be otherwise empty, and the bride and groom will be just enjoying this special moment, engrossed in each other. I love this groom's peaceful look of contentment as he dances with his beautiful bride.